Compare 3 HTC 7 Pro pay monthly contract mobile phone deals. Compare 1 HTC 7 Pro sim free/unlocked mobile phone deals. 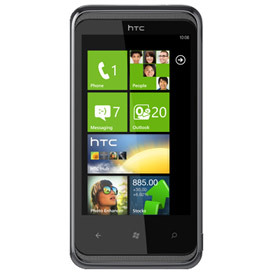 HTC add another Windows Phone 7 device to their arsenal with the HTC 7 Pro. A high performance design aimed at business users with a slide out QWERTY keyboard and tilting 480x800 pixel 3.6 inch touch screen. No one has yet rated the HTC 7 Pro. Click the link above and score it out of 5 based on how awesome you think it is. You can also leave a few comments or write your own review.